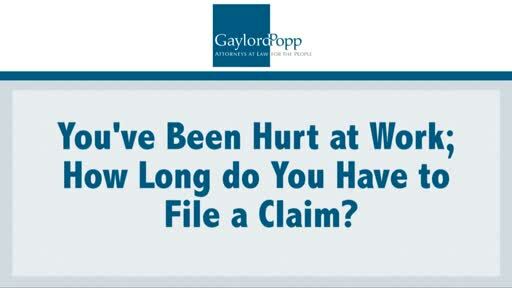 What is the Statute of Limitations For a Workers’ Compensation Claim in New Jersey? In New Jersey there is what’s called the statute of limitations. I’m Sam Gaylord, a disability attorney handling matters in areas of workers’ compensation, social security disability, and disability pension appeals here in the state of New Jersey. The statute of limitations is a particular period of time which you have in order to file a workers’ compensation claim. In New Jersey, the law specifically says that you have two years from the date of the accident or two years from the date that you last received a benefit paid to you by the workers’ comp insurance company. What is a benefit? Benefit is defined as either the payment of medical treatment or temporary disability payments which is compensation for being out of work. From the date that you last see the doctor, you then have two years to pursue a claim. So, if your accident happens on January 1, 2015 and you treat all the way through January 1, 2016, your two years statute of limitations would not start to run until January 1, 2016 and then you would then have until December 31, 2017 in order to file your claim. In addition, if you have what’s known as an ‘occupational claim,’ or an injury as a result of repetitive use or repetitive exposure to a substance you have a two year window from the date that you know you have a problem and you know the problem is related to work in order to file a claim. This information is valid as of today, April 21, 2014. The law sometimes changes, and if it changes it’s important that you pick up the phone and give me a call so that I can provide you with an exact time frame as to whether you could pursue a claim and whether it falls within the Statute of Limitations. Or send me an email at sgaylord@gaylordpopp.com.